This vegan carrot cake is so easy to make, it is moist and tastes fantastic. You can eat it as it is or add a glaze on top! It’s been like crazy the last few days. I’ve had too many things to do and so little time. Today I was out all morning and I’ve been cooking and baking since noon. We started fasting and they wanted something to eat. I made this cake today and it is very easy to make. You just mix everything together and it’s ready. The chocolate and marmalade glazing is something I added just the last minute. I’ve made it again using an icing on top. If you want a different glaze, see also my vegan chocolate ganache with tahini. I am submitting this recipe over to Gretchen Noel of Canella y Comino, who is hosting the event Thinks Spice …Think Cloves created by Sunita, of Sunita’s World. In a big bowl whisk oil with sugar and add the grated carrot. Dissolve the baking soda in the orange juice and add it to the mixture. Add all other ingredients except the walnuts, and glazing ingredients. 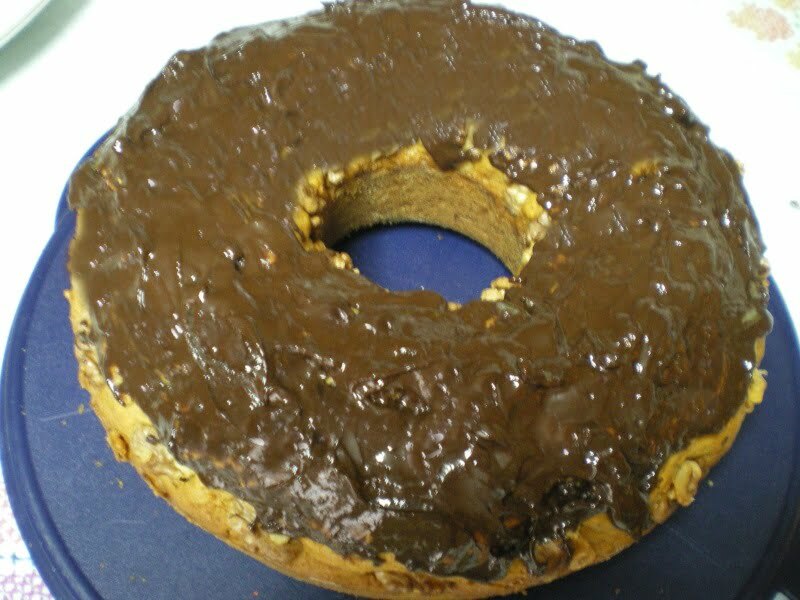 Pour it in a greased and floured 26 cm baking tin or Bundt form and add the walnuts on top. Bake for about 1 hour until a knife inserted in the centre, comes out clean. Prepare the glaze: Melt the chocolate together with the margarine in the microwave. Mix in the chocolate a spoonful of citrus marmalade (I used my lemon marmalade) and glaze the cake. For an easier glaze, add the lemon or orange juice in a bowl. Add the icing sugar and mix until you make a spreadable frosting. Pour it on top of the cake. Hi sis, you are right, I am not keeping my promise not to post every day but this will change soon. Actually there are a lot of recipes I want to post for lent and Easter, so I am trying to post at least one a day. As for the events, I just check and see if my recipe fits in any event and if it does I submit it. I’m doing it the opposite way. I’ve decided to post only 3 times a week and have weekends free and still I am short on time!!! You are right, I am bit stressed out, so definitely after Easter I shall restrict my posts to three a week. Hi Maria and welcome over to Greece. Thanks for your comment but have seen a lot of delicious food over at your blog as well. Great idea to pair carrot cake with a chocolate marmalade icing! Delicious! Thanks for participating in Think Spice!